- The original game placed stranded pilots usually down in ravines or lower level areas, not on steep hillsides as is so often the case on Fractalus. While these can be somewhat positively challenging landings, I wonder if the original take was a bit more realistic in this. - The far end of the laser beams looks a bit too much like it originates from that end in Fractalus, instead of terminating there. It sort of looks like it has a dark end point, even when it seems to terminate mid-air, which is confusing when someone fires at you from behind...? I wonder if it would simply fade into air? Or widen towards the distance like the original, so it would be clearer where the shots are coming from (and especially where they are not coming from). - I really loved the cockpitless option in pre-Unity Fractalus 0.7 and prior, especially at dusk. I understand it had historical reasons, but it ended up being a really nice option even in later versions! Please consider this in the future for the Unity version as well. And while you're at it, consider a new option where there are minimal displays and controls... Maximum scenery. - The forum registration Captcha seems to have expired at the end of March? 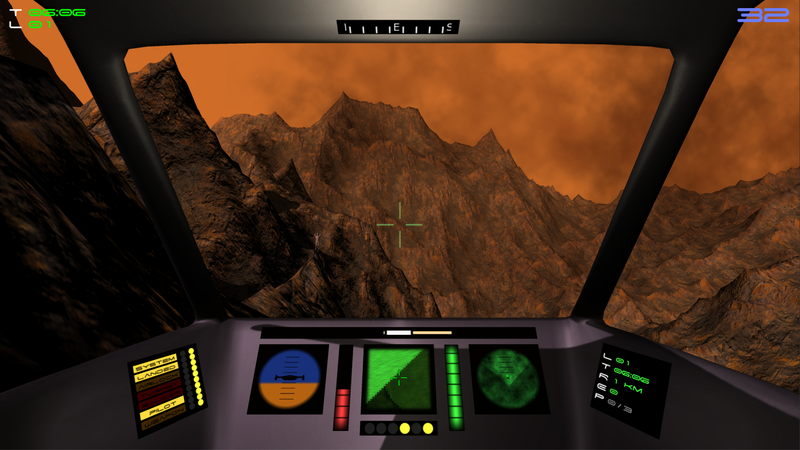 Currently in Fractalus the pilots are all placed below a specific height on the terrain, but without any consideration of the terrain around them, so some will end up in odd spots on severe slopes or in small deep pits. I'm planning to make the pilot spawner look for more suitable terrain around the pilot. Same thing goes for the turrets as they can end up in strange places too, where in the original they were entirely situated on mountian peaks. I agree that there aren't as many turrets and they are less aggressive in my remake. The saucers are particularly weak in behaviour compared to the original game (including randomly crashing into the terrain themselves!). AI improvements are planned, and when I do them I will try to match them up to the original game as much as possible. The weapon from the original game was a white bubble (described as an "Anti-Matter Bubble (AMB) Torpedo" in the original manual) that you could only fire one of at a time, waiting until the last one hit the terrain or a target. I'm fairly sure that was more a technical limitation common to games of that era. To be honest I actually forgot that the game just leaves you crashed and doesn't tell you what to do. I'd gotten so used to hitting ESC and returning to the menu or restarting during testing that it became a reflex! I also hadn't considered the implication of this for when the aliens are implemented - I like that idea! Oops! The forum doesn't get a lot of attention unfortunately and I forgot that it was using the old captcha system that has now been deprecated. Thanks Luke for the comments and insights - and I look forward to those future updates, however you decide to implement them! The saucers are particularly weak in behaviour compared to the original game (including randomly crashing into the terrain themselves!). I believe a saucer crash happens on the comparison video as well (timestamp: https://youtu.be/x5T7ZDOn754?t=108). At around 1:50 the Saucer warning starts blinking and then at 1:52 the blink goes away and one can hear a crash, without any of the usual visuals suggesting a hit on the player's ship. Oh my goodness, I stopped in to see if there was new development and just noticed that yes, you have released a new build with Unity support. It's a little late here to try it out but I will this weekend for sure and supply my comments afterwards. Out of curiosity, you had indicated previously you may consider VR support if you were going to port it to Unity (as I understand it is more or less built into Unity). Is this something you've looked into? Congrats on the release. After a tough day, this was definitely welcomed news! Now that Fractalus is using the Unity engine VR may be a possibility, however I've not had a chance to look into it. I still only have an Oculus DK1 and I'm not sure if it will work with current VR software, but when I get a chance I'll hook it up and see if I can get it running again. Another friendly vote for a VR version from here. Would be great! Keep up the good work, Luke. Sorry for the delay in responding, life is a bit heavy at times. Very impressed with the newest build, everything seemed to work very well at my end. I must admit, I would love if at some point you put in an animated fighter pilot (and would be more nerve racking if the aliens are about). It would just polish off the product ahead of it's current state. Aside from that, it's a lot of fun to move around the landscape, the control seems fine (though I need to play it some more) and the shooting is fun too. Thanks for testing it out and glad to hear everything worked well! I've got some good news - I am working on an animated pilot model for 0.9 which you can see (a very tiny version of) in the picture at https://www.lsdwa.com/blog/wp-content/u ... 1680px.png to the left of the crosshair. I set aside some time tonight to try out my Oculus DK1 with the current VR SDKs and unfortunately it seems that it's not supported at all. The original early DK1 demos I had still work as they didn't use an SDK (I think they just communicated directly with the Oculus over USB), but the new SDKs, and Unity in particular as it also now uses these SDKs, just simply don't work with it. I think those programs are also aimed toward teams building paid applications/games for their platform to encourage more people to buy hardware and also buy software which I imagine they get a cut from, and I don't intend for Fractalus to be paid for, so it wouldn't be worth it to them to send me free hardware. I'll look into getting a newer VR headset if I can, even if only because I want one to play games with anyway - which headset are you using? FWIW, I've got an HTC Vive and a Vive Pro, so I'd be happy to test Fractalus on them if it ever gets to that and is compatible with them. I think this game might be very well suited for VR! Great work on the Diamond-Square Algorithm, too.